Immigrants rights groups in the South Bay watched in disbelief Wednesday as President Donald Trump announced his executive actions on new immigration controls. They knew changes would be coming, and now they say they're up for the fight. At San Jose State, many undocumented students on campus, known as "dreamers," were watching closely. They and immigrant rights groups did not like what they heard from the president. "It was pretty difficult to be honest," said student Erica Leyva, whose parents are immigrants. "I shed some tears." The stakes are high for Leyva, as her parents are undocumented. She worries they might not return home from work one day. "To still be in fear even more really broke my heart," she said. Leyva and other students were joined by immigrants rights groups, including Siren. Afterward, the group’s leader said their workload just increased dramatically. 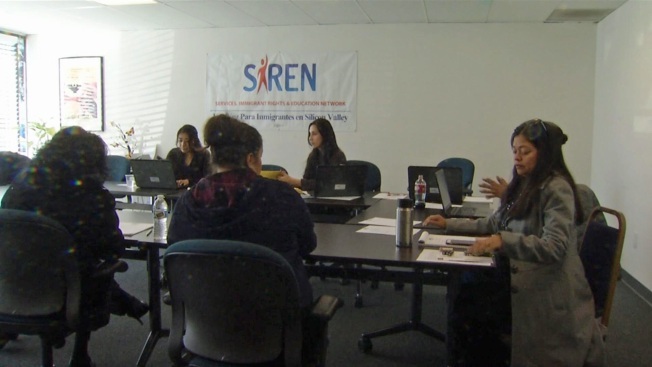 "It doubled when he came on board, and now with these new policies that he’s announced, our work has just tripled," said Maricela Gutierrez, Siren's executive director. Siren will now ask for help from more community groups, and it will reach out to attorneys to consider pro-bono work to handle the increased workload. One thing Siren says it won't do is give up. "It’s a fight we’re willing to take on, and we know we have a big fight ahead of us," Gutierrez said. Also joining in the fight Wednesday were San Jose Mayor Sam Liccardo and other community leaders in a show of solidarity. In his announcents, Trump did not mention undocumented college students specifically, but those students know they could be next.